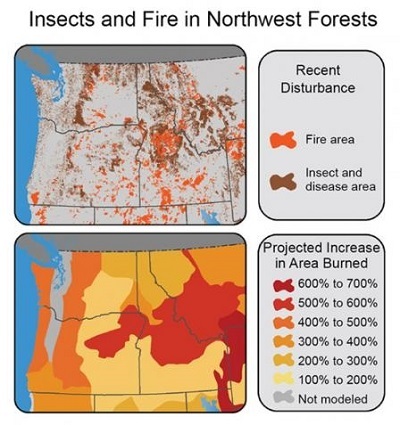 ﻿ Fun Easy English - Environment - Global warming - Climate change Impacts in the Northwest. Climate change is damaging the Northwest coastline. Projections indicate an increase of 1 to 4 feet of global sea level rise by the end of the century, which may have implications for the 140,000 acres of the region that lie within 3.3 feet of high tide. 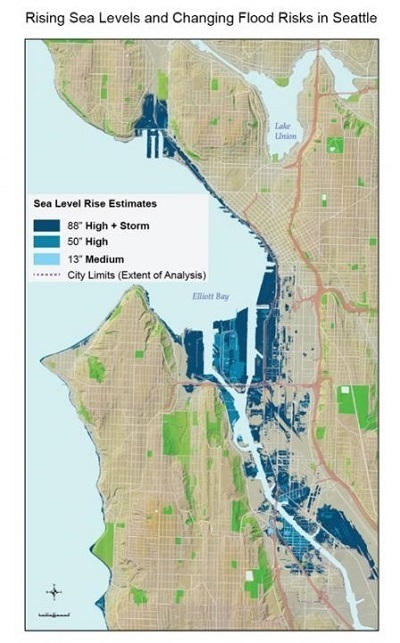 Sea level rise and storm surge pose a risk to people, infrastructure, and ecosystems, especially in low lying areas, which include Puget Sound. Warming waters and ocean acidification threaten economically important marine species and coastal ecosystems. Commercial fish and shellfish harvested in the Northwest were valued at $480 million in 2011. Warming waters have already contributed to earlier migration of sockeye salmon in some streams and earlier growth of algal blooms in some lakes. 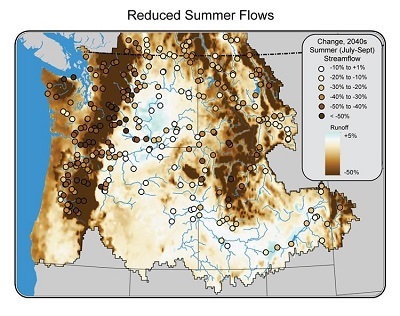 Warmer waters are likely to increase spring and summer disease and mortality in Chinook and sockeye salmon in some river basins. Species that spend all or part of their lives in rivers, including salmon, steelhead, and trout, will suffer from decreased summer flows and increased flooding and winter flows. Projections suggest that suitable habitat for the four trout species in the region will decline by an average of 47% near the end of this century, compared to past decades. Human activities already threaten Northwest salmon populations. These activities include dam building, logging, pollution, and overfishing. Climate change impacts further stress these salmon populations. Salmon are particularly sensitive due to their seasonally timed migration upstream to breed. Higher winter streamflows and earlier peak steamflows due to climate change will damage spawning nests, wash away incubating eggs, and force young salmon from rivers prematurely. Lower summer streamflows and warmer stream and ocean temperatures are less favorable for salmon and other cold-water fish species. These climate change impacts facilitate the spread of salmon diseases and parasites. Many salmon species are already considered threatened or endangered under the Federal Endangered Species Act. Studies show that by 2100, one third of current habitat for Northwest salmon and other coldwater fish will be too warm for these species to tolerate.